SAN DIEGO, CA--(Marketwired - Jul 7, 2016) - Gopher Protocol Inc. (OTCQB: GOPH) ("Gopher" and the "Company"), a development-stage Company which specializes in the development of real-time, heuristic based mobile technologies, and its partner, Guardian Patch LLC, announced today that they have completed the design and construction of the Guardian Patch circuit prototype device. The Company has completed the construction of 10 prototype units and is now proceeding with an intensive testing program. The Guardian Patch prototypes are working with the Company's mobile app, which can be downloaded for free at the Apple Store and on Google Play under the name "Guardian Patch." As a courtesy to the public, the Company previously released the Guardian Patch app to provide users with live views of the Guardian Patch units during testing. 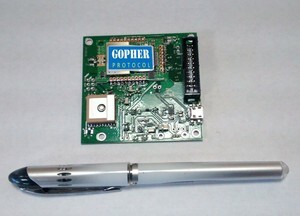 The Guardian Patch prototype unit contains the Company's GOPHERINSIGHT™ integrated circuit technology (see image below). The Guardian Patch prototype consists of mobile units and base units. The base unit is programmed to report on each mobile unit's real-time position to a web-based computer program which analyzes the information and sends it through the internet to the mobile app. The end results is an accurate location and progress presentation of the Guardian Patch mobile unit on a mobile map. The prototype system is currently reporting about the mobile unit's location every few seconds in order to test a real-time positioning system. In this way, viewers may view live, real time movement of the tested mobile units on the app's map. The web-based program is also providing statistical information about the mobile units, including, but not limited to, travel distance, cities visited, travel time and more. This data will be used in the future to enhance customers' vital statistics for personal purposes. In addition, other electrical factors are measured and studied, such as electrical power consumption, transmission intervals, terrain and weather effects and more. In parallel, the Company is constantly enhancing and improving the system's software to handle large amount of mobile units and their coverage. Special attention is also given to human engineering of user friendly UI (User Interface) of the mobile application software and the web-based control program. Additionally, a robust database management system is being designed in order to manage large number of mobile units efficiently. The Guardian Patch prototype, which the Company hopes will arrive in the consumer markets sometime in 2017, of which there is no guarantee, is a unique location technology that works with or without GPS. It is a stick-on tracking device that protects and tracks objects, from a phone to a laptop to a loved one or a pet, through a mobile app.